A large format, high quality art book…. full of dynamic, beautifully observed watercolours. 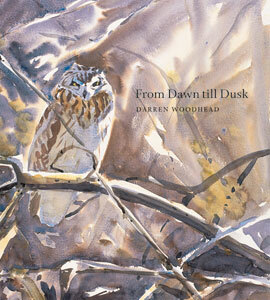 The work of Darren Woodhead shows an artist attuned to the pulse of nature. His ability to capture fleeting moments, subtle, changing light, and the colour of each hour and season is remarkable. I loved the sketchbook studies of Brown Hares and lively painting of aggressive Shelducks, displaying Long-tailed Ducks and some terrific Curlews caught my eye- the book is filled with evocative images of all that’s memorable for wildlife watchers. A magnificent bird art book… the printer’s reproduction of his work is excellent, so that on every page you can enjoy the luscious fluid nature of the paint….. Darren creates pictures that work.